When did “science” begin? The answer to that question depends on many factors, including the nationality of the questioner and the definition of science. For David Knight, the scientific endeavor is “a voyage of discovery,” and he develops this metaphor to explore a period of scientific development. While he readily acknowledges the travels of the Vikings and the contributions of Muslim scholars, he argues that modern science began with the sea voyages beginning in the 1480s and ’90s. These intrepid explorers set out into unknown oceans and discovered new lands. Knight’s voyage ends with the travels of James Cook and his transoceanic explorations in the South Pacific and other parts of the world, ending with his death in Hawaii in 1779. Knight’s focus is on European science (which explains his selection of voyagers, all European explorers). He traces the development of scientific ideas in Europe and closes his account in the late 1700s after the Revolutionary War. With the election of George Washington as the president of the new nation of the United States of America, Knight sees the course of science shifting to the New World with the U.S. gradually achieving preeminence in this arena. Unlike many authors writing about the interface of science and religion, Knight sees the two ideas as being complementary. He recognizes that many early scientists were devout Christians and were motivated by their desire to understand better the world given to them by their Creator. In addition, much of the culture was preserved in monasteries during the Dark Ages. Priests often taught natural science in the newly developed universities. Knight points out in more than one place that the freedom to think and explore the scientific world rose concurrently with what has been referred to as the Long Reformation (1500–1750), where independent reading of Scripture and thinking became more prominent. One very interesting thread is the interrelationship between the scientist, the craftsman, and the business interest of the day. Scientists did not live in ivory towers, removed from the daily needs of people. Very often, their studies had practical applications that could be put to use by others. Examples include improvements in metallurgy that came out of basic chemistry research. Significant improvements in medical treatment and health practices arose from studies in anatomy, physiology, microbiology, pharmacology, and related sciences. Technological advance in many fields of science made it possible for people to do their work more efficiently and with less effort. Knight devotes separate chapters to specific key issues in science. He ably describes both the scientific advances of astronomy and mathematics, as well as the political and personal intrigues of the time. The development of alchemy and its successor discipline of chemistry are detailed with a great deal of very interesting information, including the roots of the “scientific method” and rise of the concept of experimentation. “The Two Books” takes an evenhanded (and understanding) look at the rise of science and its interaction with religion. Physics, biology, and medicine each receive a detailed analysis of their history and contributions to science. Students could especially benefit for the chapter on practical science to see the concrete applications of science to everyday life. The book contains a very useful set of notes on each chapter, along with a lengthy set of recommendations for further reading, and a detailed index. The reader has the tools to explore further the ideas set forth in Voyages. 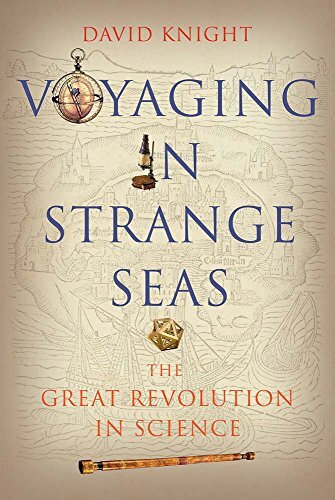 Voyaging in Strange Seas is an excellent source of information about the history of science. Its particular value lies in the extensive coverage of how science has influenced the social and political lives of people and countries.